After puffing the iPad, making cracks about the people who couldn’t attend (Gizmodo among others, we wonder why) and telling us all about the app store (15000 apps submitted every day..) Steve Jobs launched into a description of the new iPhone. Despite all the cynics out there, we were literally on the edge of our seats for this. TWO: Thinner: 24% thinner, it’s only 9.3mm wide. FOUR: Front-facing camera and a flash for the back of the case camera. SIX: New chip – made by Apple, the A4. SIX: Gyroscope – this sensor makes gaming even more fun, we’re told, Steve demonstrates by knocking over blocks of wood in an app-game. SEVEN: Those Cameras again – they’re 5megapixels, and they’re smart. They “capture more photons” and produce good quality images in low-light. And you video call with your other iPhone 4 buddies (only works on wifi). EIGHT: iMovies, will an extra paid-for app onboard the phone, lets you edit movies as they film. NINE: Comes in Black and White. 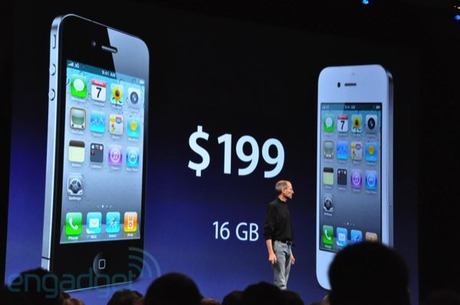 TEN: Price – not bad, $199 for the 16gb, $299 for the 32gb. is it a fake chinese i phone or real? I have the iPhone 4 and have no antenna problems. I absolutely love this phone and wouldn’t trade it for any other phone out there. Not to say androids aren’t good phones too. Pure, it’s going to be on all the new Android’s as well. -It’s still on the worst carrier (and why I won’t consider another iPhone). -SD cards still not supported when the Androids will soon have 64gb models because of this. -AT&T and Apple restricts functionality (tethering, IP Phone and much, much more). * 802.11n Wi-Fi, Bluetooth 2.1. We offer prompt shipping from our Store, The product will arrive at your destination within 2 or 3 Days Via UPS/FedEx Courier Services. Front-facing camera is the star quality of iPhone 4G. I will definitely prefer it to others. Please don’t misuse the word exponential.